Since leaving the production line as an original left-hand drive and exported to Peter Lindner Cars, Frankfurt in September 1965, this original matching numbers Series 1 4.2 Coupé has returned to the UK, reclaimed its original registration and been treated to a full restoration. Today it is presented in exceptional condition and finished in an attractive colour scheme of Opalescent Silver Grey and Red leather. 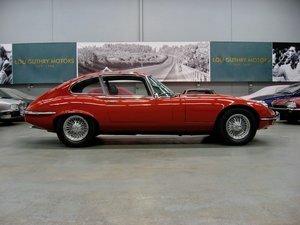 First registered to a A Konttila, Finland, finished in Jaguar Warwick Grey over red trim, as highlighted by the accompanying Jaguar Heritage Trust Certificate, this stunning 4.2 Coupé example is believed to have remained in Europe for some 30 years before returning to the UK in the early 1990s finished in White. M Hallett of Bristol, became the car’s custodian sometime after the cars import and proceeded to keep the car well maintained, building up a large invoices history file. 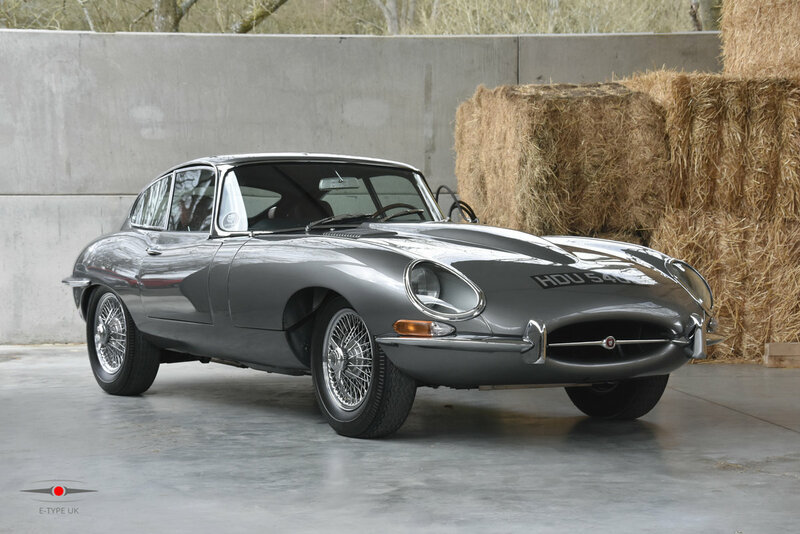 It wasn’t until 1997, Hallett took official ownership after purchasing the vehicle from ‘The E-Type Centre’ Staffordshire for £10,650. 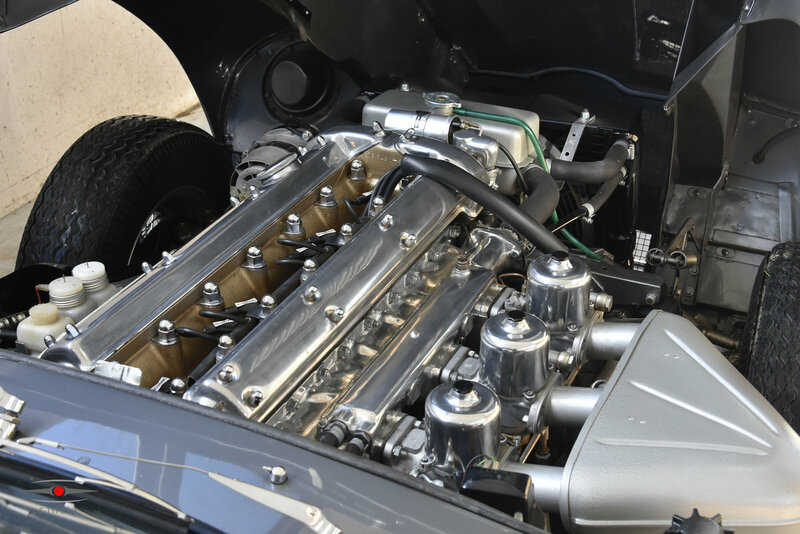 It was late in 2008 when the E-type arrived in Kent and would soon begin its full nut and bolt restoration by Alan Carrington Classic Cars. 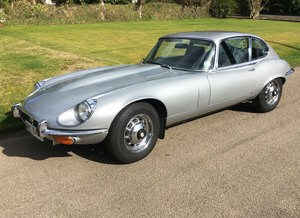 Leaving no stone unturned, the E-type was given the full treatment which included a bare metal bodywork, full drivetrain rebuild, rebuilt backend, respray to the Opalescent Silver Grey and retrimmed to the fine standard you see today. 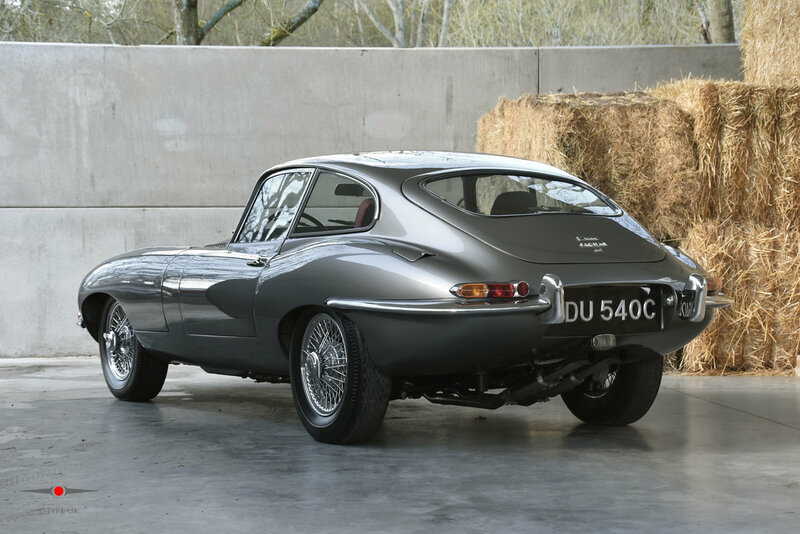 Completing its transformation late in 2014, accompanied by another lengthy invoice history folder, final upgrades were made to the E-type improving the overall driving experience, these included a full tubular stainless steel exhaust system and 4 pot brake callipers, restoring the sound and feel of a true sports car. The project was completed when the factory UK registration, HDU 540C, was reclaimed and assigned to this now breathtaking Series 1 example. 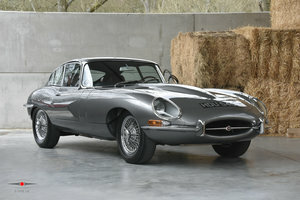 The current owner acquired the E-type towards the end of 2015, pleased with such a stunning example produced by Alan Carrington, the E-type would later return to the specialist for future work, which included a professionally fitted air conditioning system and power steering, creating a modern environment packaged in a classic 60’s body. 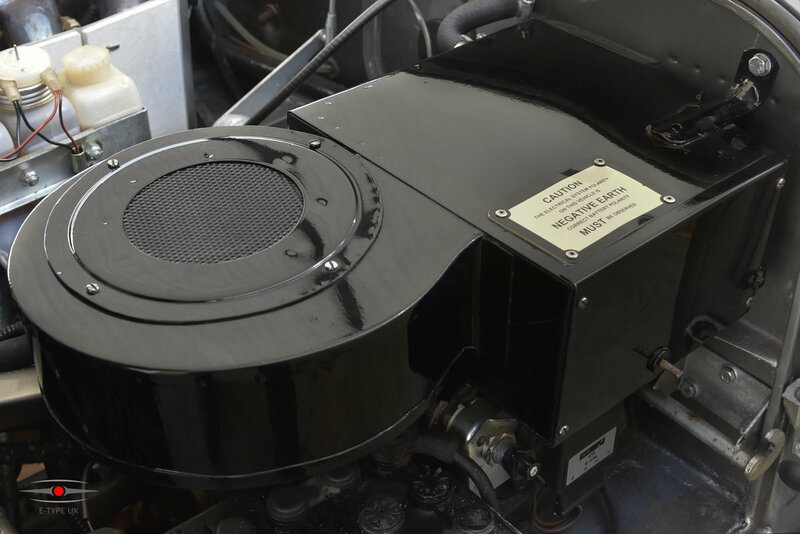 *All original parts have been retained from the upgrade allowing for an easy transition back to factory spec. More recent years have seen this example sparingly used and stored in a dry heated garage, ensuring it retains its immaculate finish and quality. 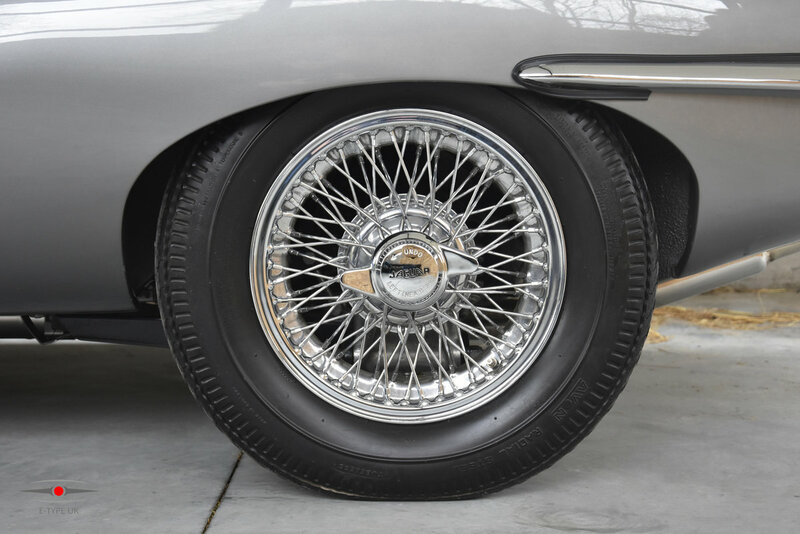 Benefiting from a true classic car enthusiast ownership since its restoration the E-types bodywork is in fabulous condition with spotless chrome and brightwork. 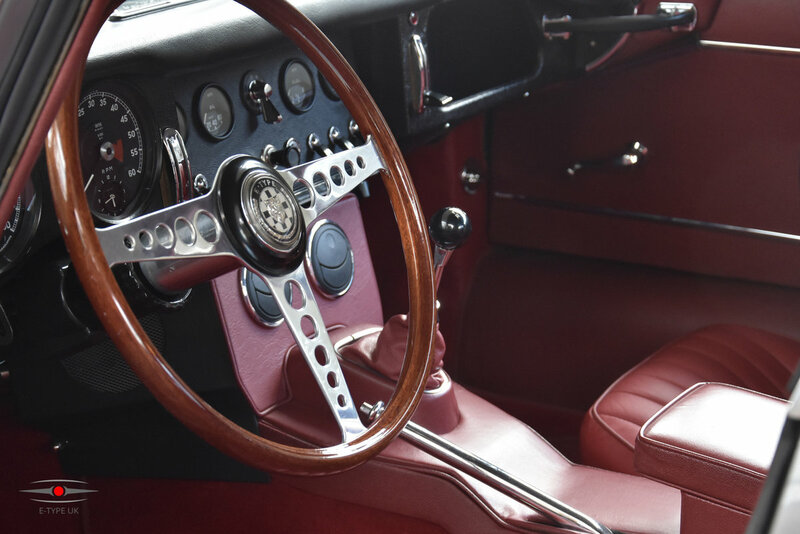 The car's cabin continues to please as its retrimmed red interior creates a comfortable and luxurious atmosphere, boasting exceptionally clean dials and gauges. Starting on the button, the fully rebuilt 4.2-litre engine plays an enjoyable soundtrack through its full tubular sports exhaust. Once on the move, you’ll be pulled smoothly down the road by a precise rebuilt 4-speed synchro gearbox, all adding to what proves to be an unmissable opportunity to purchase an incredible original LHD Series 1 fixed head coupé. If you’d like to arrange a viewing to see this stunning example, then please contact us on 01732 852 762 or email [email protected] for more details.